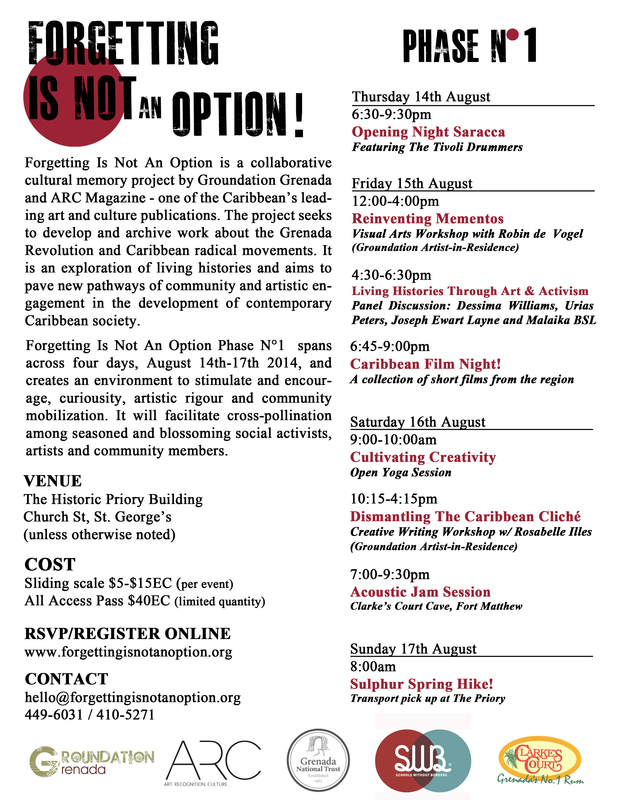 Groundation Grenada in collaboration with ARC magazine announce the launch of Forgetting Is Not An Option Phase N°1 – a multimedia cultural memory project in which the Grenada Revolution (1979-83) is a point of departure for envisioning a new Caribbean. From 14th to 17th August, 2014, with support from Schools Without Borders, a Toronto-based community organization, we will host dynamic workshops by visiting artists-in-residence Rosabelle Illes and Robin De Vogel, screenings of Caribbean short films and so much more! Courtesy of The Grenada National Trust all events will be at The Historic Priory building on Church Street with the exception of our Acoustic Jam Session at the Clarke’s Court Cave in Fort Matthew on Saturday 16th August starting at 7:00pm. The final event of Phase N°1 will be a Sulphur Spring Hike on 17th Sunday August but we will meet at The Priory. Click to enlarge & view our full program! Groundation Grenada’s next step for Forgetting is Not an Option is our Open Call. October 31st 2014 midnight is the deadline for persons to submit their new and existing writing, art, performance, films, interviews etc. about the Grenada revolution and Grenada’s rich cultural memories. The goal is to create an archive and multi-layered language to discuss our histories. This will provide educators artists, academics, students and the general public with a vast resource made up of many local, regional and international voices. Forgetting is Not an Option has the potential to directly impact upon the educational curricula used in schools and welcomes institutions and individuals interested in collaboration. The project encourages people to be creative in how they remember and interact with important historical milestones and how those moments, the triumphs and failures, can be use to inform future directions.